If you need a knife heavy enough for chopping wood, the Ka-Bar 14-1/4-inch Bowie could be a match. The tactical black high carbon 1085 steel blade is flat ground and tempered to Rockwell 55 to 57 -- it's a strong edge that will even hold up to rocks without serious damage. If you try skinning a deer with it, you may miss a lighter knife's hollow ground razor edge. This Bowie is better at the rough work. With a Kraton grip formed securely to the rat tail tang, this big Bowie knife has more of the feel of a machete, which Ka-Bar makes in a very similar pattern. Both styles of knife use the same materials and are produced by the same suppliers in Taiwan. Standards are set pretty high for the Bowie, at least in terms of durability. You can treat it much like an axe without doing it harm, since the blade is a full quarter-inch thick. It probably will come in most useful as a substitute for a light camp axe and work well for the same chopping and trimming chores. Amazingly enough, the knife only weighs 8 ounces due to the rat-tail handle build and the Kraton grip. You could get a stronger knife in a heavier full-width tang -- but with the Ka-Bar Bowie, there's no reason to be concerned. 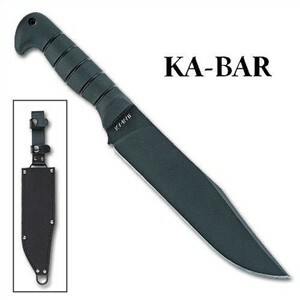 Ka-Bar has been building pry-bar strong knives with rat-tail tangs for a very long time. A black leather-backed nylon sheath comes with the Bowie and includes a ring at the tip so you can strap it to your thigh like Rambo. In this case, it makes sense to do that.